I have just been on the Chew Valley Ringing Course in Somerset. This long standing course offered training in mist netting of various species covering Reed habitat, garden birds and also hirundines. Together with this information on moult stratagies and other catching methods were also given. This year there were mainly trainee ringers attending the course and we had a good mix of birds caught and we were able to look at their plumage in great detail. This is a regular ringing site so there were plenty of known age birds. About 300 birds were caught during the 3 days including a bird that was ringed further north by West Wiltshire Ringing Group and also an adult Sedge Warbler that was already ringed by the French Ringing Scheme (Paris)! Ringing details are on there way. 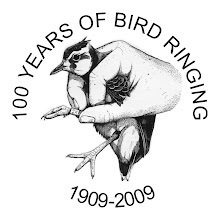 Ringing Courses are an excellent way for ringers to get extra experience in various aspects of ringing and also be assessed for permit upgrades. These are particularly useful for ringers applying for training endorsements. Courses are currently full for this year and usually run from June to October but future courses will be on the BTO website next year. It is advisable to book early! Thanks to all that participated on the course and to Ed Drewitt for the photos and Mike Bailey for the image of the Paris ring.